Over the hills of… needlegrass? High winds throughout the state of New Mexico caused various problems Thursday, from damage to buildings and trees to low visibility from blowing dust. 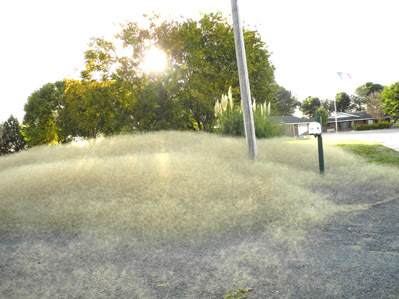 But in Artesia, the blustery day also sent needlegrass flying, and it collected like snow drifts in some locations around town. 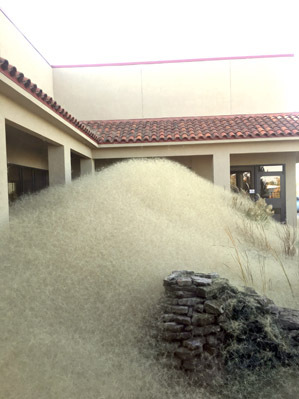 Above, needlegrass completely covers the front of PVT in the 4000 block of Main Street Thursday, piling as high as the roof. At right, the pesky grass gathers in the yard of a home on Firehouse Road in drifts higher than the mailbox.